Our goal is to foster, encourage and install a joy of learning, the wonder of discovery, and a love for God and his creation in all our children. Please visit our pre-school page to learn more! Sunday School meets during the church service on Sunday. Children come to the Sunday school room at the beginning of the service, and then attend until 11 am. At 11 am they go to the fellowship hall for snack, and their parents/guardians pick them up there. The hour consists of a lesson, (Last year’s lessons were based on the book Adam, Adam, What Do You See?) During the time of the lesson, there is usually a story, a craft, coloring and then 15 minutes of music/all together time. 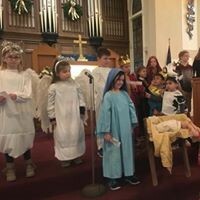 Periodically, the children that attend Sunday School act as a “Children’s Choir” and sing during the Family Sunday service. 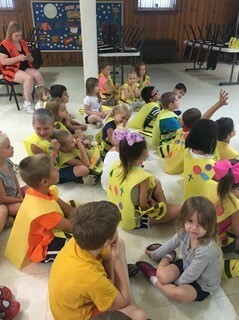 To be a part of all the excitement at Rolling River VBS, call Jessie Kubuske at (440) 988-4965 or contact us.